This sauce is the gift that keeps on giving. Use the leftover sauce to douse plain pasta or even boiled eggs. It is worth the small effort of making it from scratch – the flavour is glorious. 1. Combine the meatball ingredients in a bowl, using your hands to work the herbs and spices through the meat mixture. Roll into golf balls (or whatever size meatballs you prefer) and place on a baking tray lined with baking paper. Cover and place in the fridge until ready to cook. 2. For the tomato sauce, heat half the oil in a saucepan over medium heat and gently fry the onion, garlic, chilli, salt and pepper for 15 minutes or until onions are glossy and transparent. Add the fresh tomatoes and the rest of the oil and simmer over low heat for another 15 minutes. Add the tinned tomatoes, and simmer over low heat for one hour. 4. Preheat the oven to 220C. Remove the meatballs from the fridge and bring to room temperature before roasting in the oven for 10 minutes, turning once until they are starting to brown. 5. Pour half the tomato sauce into a large saucepan, add the meatballs and ensure they are thoroughly coated in sauce. Poach the meatballs in the sauce for 10-12 minutes. 6. Cook the pasta according to packet instructions. 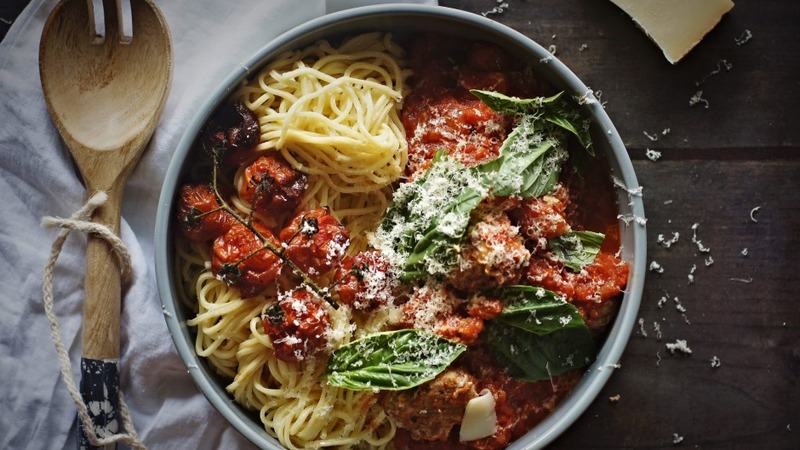 Drain, divide among serving bowls and top with meatballs (between two to four a person) and any extra sauce. Season with salt, pepper and chilli flakes (if using), scatter over basil leaves and generously cover in fontina. Serve hot.